Dr. Vivek Murthy was dismissed from his position yesterday as U.S. 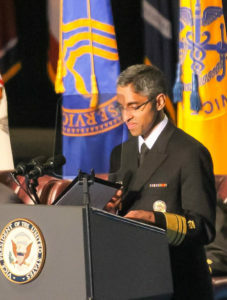 Surgeon General. He and I have been friends for a long time. Although I knew this moment might come, it remains bittersweet for me, as it surely is for so many others. My regrets go beyond the personal. Dr. Murthy is pursuing an important agenda to improve population health. I hope that his successor can continue this important work, which should command bipartisan support in a polarized time.Â He is an exemplary role model for others at high levels of leadership in American public life. Dr. Murthy released a statement on Facebook. I reproduce it below the fold. It expresses the dedication, reflectiveness, and generosity of spirit he brings to his life and work. Thank you for your service to the nation, my friend. I can’t wait to see what you will do next. During my tenure, I was blessed to have an extraordinary team of dedicated public servants who became my colleagues and friends. I was also fortunate to find thousands of dedicated partners in the community from schools and hospitals to faith groups and mayors. Together, we called our country to action to address the addiction crisis in America through the nationâ€™s first Surgeon Generalâ€™s Report on Alcohol, Drugs, and Health and by urging more prevention, treatment, and humanity in our approach to this chronic illness. We sent letters to millions of health care professionals urging them to join our campaign to Turn the Tide on the opioid epidemic. We issued a report on e-cigarettes and youth, launched a national effort to get Americans walking, and started a community conversation on food insecurity. We partnered with Elmo, the cast of Mom, and Top Chef to inform the country about vaccines, addiction, and healthy eating. And we worked with thousands of Commissioned Corps officers to protect our nation from Ebola and Zika and to respond to the Flint water crisis, major hurricanes, and frequent health care shortages in rural communities. I am exceedingly proud of what our team and our officers have done to bring help and hope to people all across America. 2. We will only be successful in addressing addiction â€“ and other illnesses â€“ when we recognize the humanity within each of us. People are more than their disease. All of us are more than our worst mistakes. We must ensure our nation always reflects a fundamental value: every life matters. As my colleague Rear Admiral Sylvia Trent-Adams takes over as Acting Surgeon General, know that our nation is in capable and compassionate hands. I'm not competent to judge his efforts in other domains, but with respect to e-cigarettes the work produced by his office was scientifically laughable and hugely harmful to the public health. Resisting an orthodoxy is always hard; maybe Dr. Murthy never had time to examine the science himself. But getting nicotine harm reduction wrong will cost lives unless the current misguided policy direction is reversed. This is as good a time to ask as any, I suppose. What do you think of the story in Slate claiming that the secondhand smoke studies were largely wrong? Slate often seems to me to be contrarian for the sake of contrariness, but then, I've seen the claim about third-hand smoke, in which the breath of a granny who smokes endangers a child in her presence, taken seriously, so. This might be relevant: "Disclosure: I worked at the Cato Institute almost a decade ago when it received some tobacco company donations. Also, as part of my career as a bartender, I made cocktails at a 2016 event sponsored by Diamond Crown; I wasn’t paid, but I was given a humidor and cigars as thanks." Since I'm a competent reader, I'd read that, and no, it's not particularly relevant. The motivations of the person writing the story have nothing to do with whether or not the science it reports on is solid. The linked article in Scientific American about third-hand smoke was pretty explicit about the usefulness of the claim in discouraging smoking despite there being exactly zero scientific study of the question. It strikes me as kind of backwards that the only study mentioned in there was a study measuring whether people knew about the dangers of third-hand smoke. I'd like to have seen some study on whether there are any dangers from it–in fact, I'd like to know exactly what's in it–before asking people about those supposed dangers. Which is all a tangent. I should have asked, "What do you think of the science reported on in the Slate story claiming" etc. Previous Previous post: Why does art stupefy otherwise smart people?